Echo Plus connects to and controls smart lights, locks, plugs, sensors, and more. Just power on compatible products and say, “Alexa, discover my devices.” Echo Plus will automatically detect and set up those devices so you can control them with your voice. This simple set up process works with dozens of compatible smart home devices that use Zigbee. 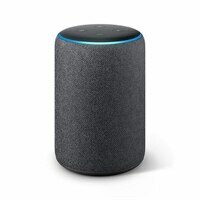 Echo Plus also supports every Works with Alexa smart home device. Echo Plus has a new premium speaker design with Dolby Processing, engineered for high quality audio. Use your voice to ask for any song, artist, or genre from Amazon Music, Spotify, Pandora, and more, and play music across compatible Echo devices across your home. You can also listen to Audible, podcasts, radio stations, and more.